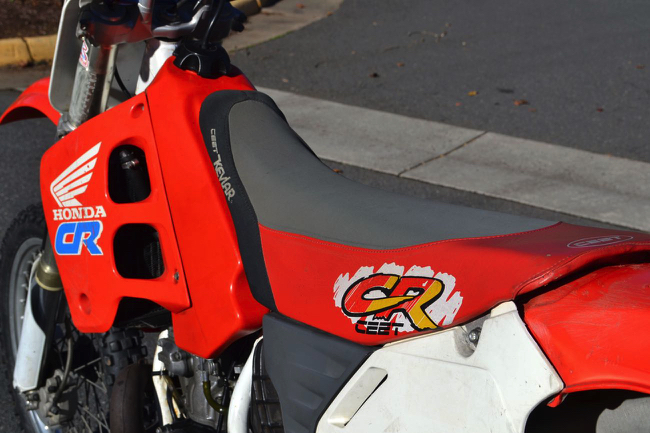 I have a soft spot in my heart for the 1990 Honda CR’s. 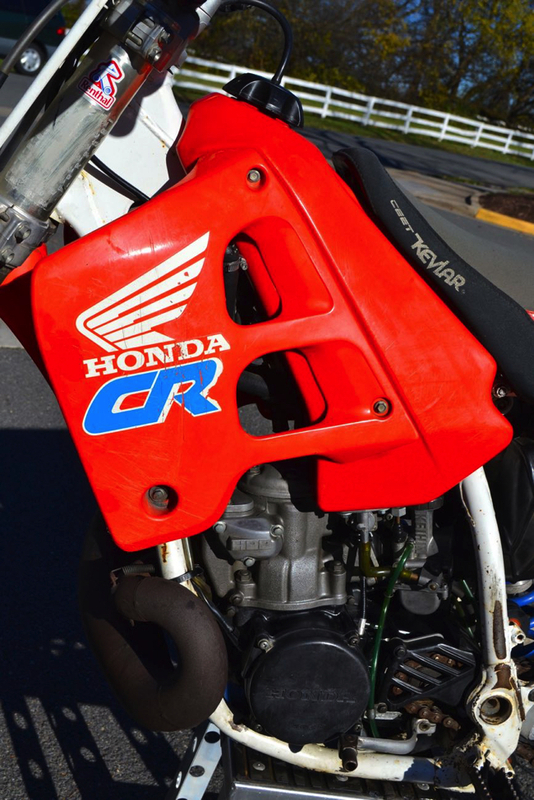 As any of you who read my work on PulpMX or follow me on social media know, I have a soft spot in my heart for the 1990 Honda CR’s. 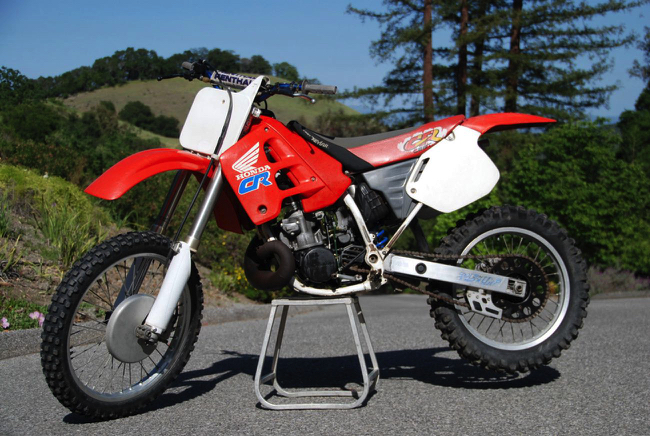 I picked it as one of the all-time best looking motocross machines ever HERE and even used the iconic 1990 CR logo as my online avatar for quite some time. While Matthes did not agree with me on it being so high on the list (In fairness, he was probably right, maybe I was watching too many 90210 reruns that week?) the bike still remains an all-star in the Blaze pantheon of badass machines. Back in the day (that is pre-iPhone 4 to you wet-behind-the ears whippersnappers out there), I owned all three of the 1990 CR’s and loved every one of them. The 125, 250 and 500 were all rockets that year and great bikes overall. Their one failing was the suspension, which defied fixing at the time. I fiddled with every clicker and spun every dial in a constant quest for a better ride, but it never really got any better. I actually had Bumpsticks (no joke, there really was a Bumpsticks here locally in MD at the time) do the forks on my 125 and 250, and they got slightly better, but you had to change the oil constantly, or the damping went right to hell. Interestingly, the forks on the 500 seemed to work better for some reason. Maybe the power or weight smoothed things out? 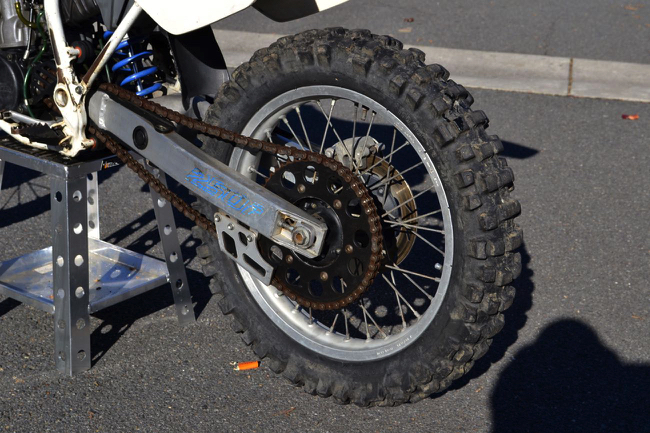 Whatever the reason, none of them were anywhere near as good as my friends’ YZ, KX or RM suspensions. This leads me to my current situation, where I have long since retired from banging bars on the track, but still love to ride and wrench on machines in my garage. 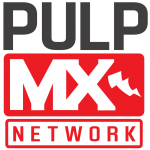 The last few years, I have been keeping an eye out for a nice project bike and Matthes and I have talked from time to time about me doing one for the site like his Project ‘90 KX250 and Project ’88 YZ250. Because he knew I was looking, Steve was nice enough to keep an eye out and hit me up when the right bike came along. 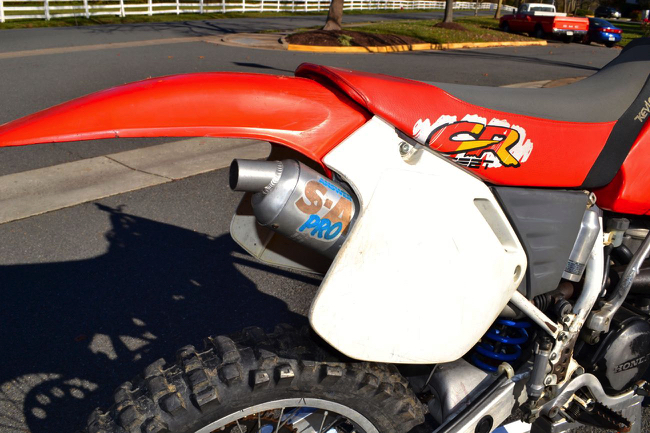 A few weeks ago, Matthes found out Nick McCabe at RacerX was looking to sell his 1990 CR250R. 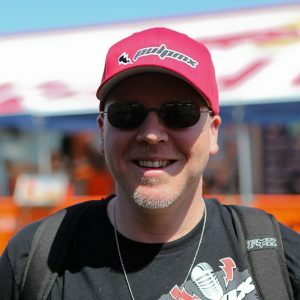 Nick is the guy who writes the “Where Are They Now” column for the site and has an amazing collection of badass classic bikes. 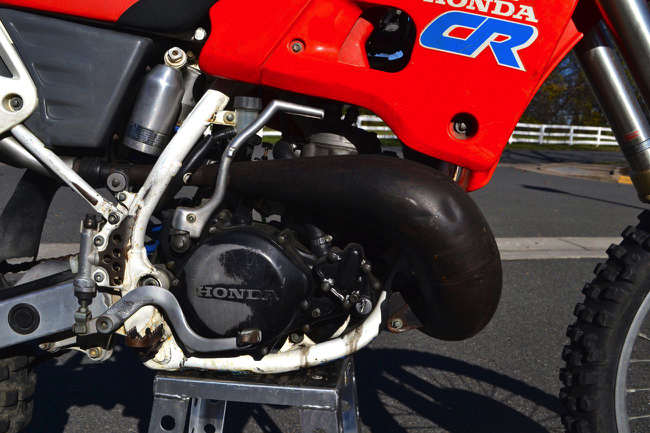 He had come across the bike while looking for a 1990 CR125R (Nick is a fellow 1990 Honda aficionado) and found a guy with a remarkably clean 125 for sale. The bike had been his wife’s ride and had very low hours and little wear. The only problem was, the owner only wanted to sell the 125 if Nick would buy the 250 as well. The 250 was not nearly as clean as the 125, but it was a California bike, so it was not as beat to death as your typical East coast machine. It ran, but had the normal wear and tear you would expect on a machine that was used, but not babied. In other words, the perfect base for a nice classic restoration. After Matthes got Nick and myself together, we worked out a deal for the 250. He got his ultra-sweet 125 and I got a nice 250 project to work on. Over the next couple of months I am going to tear the old girl down and hopefully, bring her back to her former glory. I’m still not sure whether I am going to stick with a stock look, or try and go the Stanton replica build. I’m also flirting with the idea of going with the 1991 graphics, just to spice things up a bit. 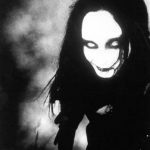 I actually HATED this look when it came out in 1991, but I find now that it is cool, in a very nineties sort of way. 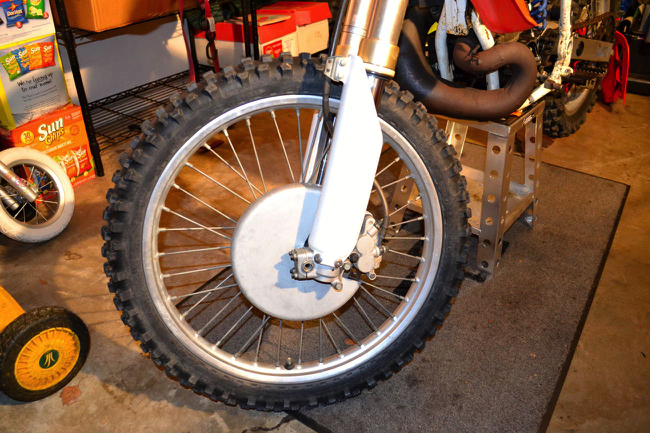 I might also see if Race Tech can do anything with those God-awful forks. For this first installment, I am going to focus on the bike as it arrived at my door. I will highlight the items that stood out to me under first inspection and make note of the items I feel need addressing. As I get into the restoration, I hope to post regular updates with my progress. The CR as it arrived to me was in good condition for its age. The motor starts, but does not run quite right (I suspect the HPP valve is not opening properly) and the gas tank leaks like a sieve at the petcock. Although it is hard to see in the this photograph, all the plastic is pretty beat up and will have to go if we are going to have the old girl standing tall. The throttle feels like its been drug through a bucket of sand and the clutch is a real bear. A quick inspection of the clutch showed that the cable wire was frayed and coming apart, so that will need replacing. The throttle cable proved ok, but the throttle tube was so full of grit that it grooved the outer surface of the bar. I tried cleaning it thoroughly, but that gritty feeling just won’t go away. It looks like I am going to need to pop for a new throttle tube as well. I would bet money this is the original Dunlop K490 that came on this bike 25 years ago. 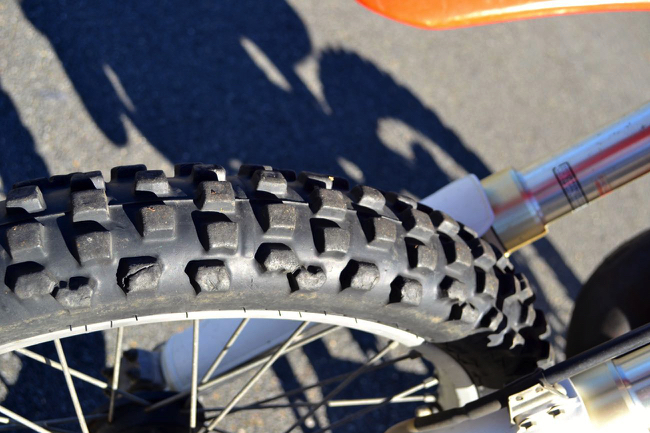 The knobs are pretty worn down, but riding in the dunes was probably not too hard on front tires. I just have to decide if I am going to go Dunlop, or try out some of the new Michelins. Remember when Answer made silencers (and could actually spell “Answer”)? 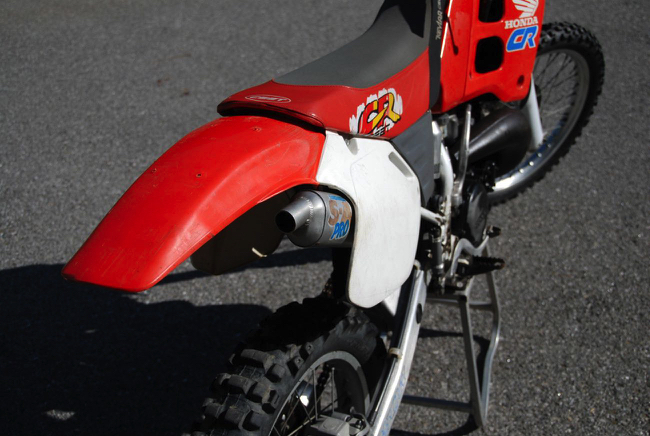 In the late eighties and early nineties, the Answer line of exhaust products was actually quite good. This S-A Pro is well built and pretty quiet, but my wife commented that the end cap reminded her of a dude’s package (I personally, had never noticed this, but once she said it I can’t un-see it), so it will need to go. Another few items for the round file are this hideous steel sprocket and power-sapping (and rusty) O-ring chain. The mud flap will also need addressing, as it appears one of Matthes’ basset hounds has chewed most of it away. 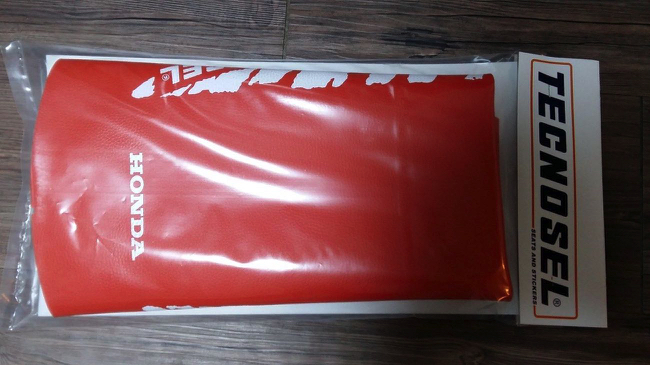 This CEET Racing seat was pretty trick in 1991, but I never cared for the looks of this gray non-slip material, so it is going to need to go. I am going to need to score some seat foam too, as this foam is pretty bunched up in the front and no longer sits against the tank properly. 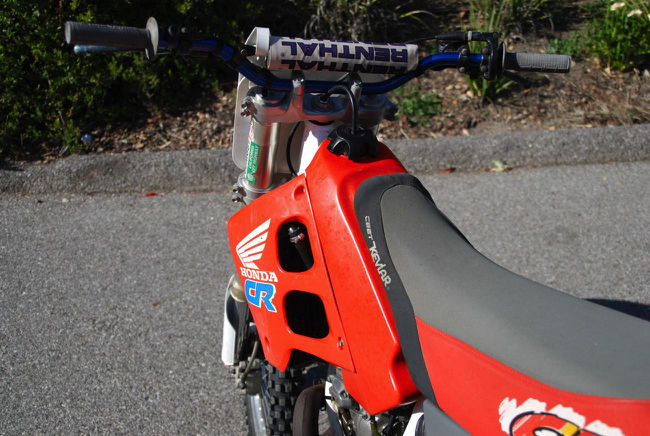 I’ve always loved the clean and no-nonsense looks of the stock 1990 Honda graphics, but I am considering going with 1991 graphics and plastic just to spice things up a bit. There are four holes drilled into the CR’s back fender. I assume this was for a tool bag or six-pack beer cozy. I have never been a fan of these Devol brake covers. I suppose they were cool at one time in a Robocop sort of way, but they are just not Blaze approved today and must go. As a side note, the brakes appear to be completely worthless. The fluid is clear and the lever is firm, but there is absolutely no bite. They basically feel like drums compared to anything modern. I’m hoping it is just the pads that need replacing, but will have to dig deeper to figure out where the missing pucker power went. This Pro Circuit pipe has certainly seen better days. It is pretty free of dents overall, but appears to have been painted at some point, then left to rust. I may try resurfacing it and seeing if it can be saved. I would love to score a nice stock one, but they are about $400 from Honda. Of course I could always pretend this is a four-stroke and then $400 would seem like a deal. I have already scored a couple of sweet finds on Ebay. This Tecnosel seat will work if I go for the Stanton replica (the Factory bikes ran the tiger-stripe seat after the mid-way point in the 1990 season) or decide to go with the 1991 look. 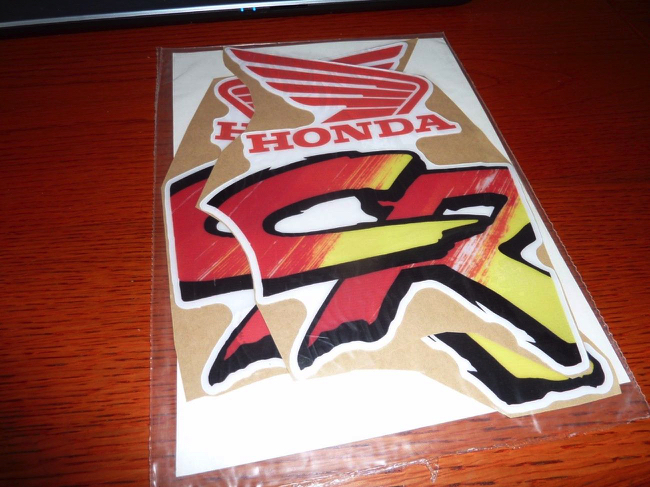 Another nice find, I got these 1991 graphics off of Dirk Timmer. Dirk has one of the most amazing stores on Ebay and is always posting trick and hard to find stuff for eighties and nineties MX bikes. He even comes across the occasional works part, so if you have a classic bike, make sure you add timmer_dirk to your preferred searches. Here is a link to a video of the old girl if you would like to check it out.